The Maurice Farman MF.11 Shorthorn is a French reconnaissance and light bomber biplane developed during World War I by the Farman Aviation Works. 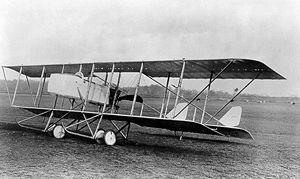 It was essentially a Farman MF.7 with a more powerful engine, and a more robust and aerodynamic fuselage, which was raised above the lower wing on struts. The aircraft was also fitted with a machine gun for the observer, whose position was changed from the rear seat to the front in order to give a clear field of fire. Its name derived from that of the MF.7 Longhorn, as it lacked the characteristic front-mounted elevator and elongated skids of its predecessor. The MF.11 served in both the British and French air services on the Western Front in the early stages of the war. As a light bomber it flew the first bombing raid of the war when on 21 December 1914 an FM.11 of the Royal Naval Air Service attacked German artillery positions around Ostend, Belgium. The MF.11 was withdrawn from front-line service on the Western Front in 1915, but continued to be used by the French in Macedonia and the Middle East, while the British also used it in the Dardanelles, Africa and Mesopotamia. Italy's Societa Italiana Aviazione, a Fiat company, licence-built a number of MF.11s under the designation SIA 5 from early 1915, fitted with a fixed forward machine gun and a 74.5 kW (100 hp) Fiat A.10 engine. In 1916 Australia bought some MF.11s for training purposes. The Canada Aviation Museum has an MF.11 manufactured by Airco for the Royal Flying Corps and sent to Australia in 1916. Farman F.11A-2, Royal Army and Military History Museum, Brussels, Belgium. Farman MF.11 Shorthorn (#CFS-15), RAAF Museum at Point Cook, Victoria, Australia. Farman MF.11 Pictures and Farman MF.11 for Sale.